It is not unknown that walking flexes your muscles and makes you healthier and fitter. But have you ever wondered what exactly happens to your body once you start walking and continue walking for 60 minutes? 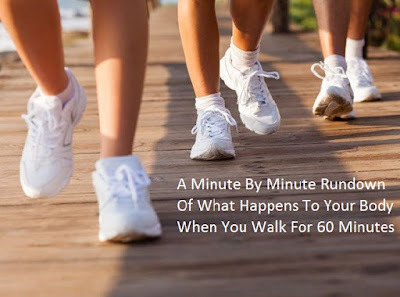 Here’s an amazing minute by minute rundown of what happens to your body when you walk for 60 minutes. In the first five minutes of your walking schedule, your body releases energy producing chemicals that boost the warming muscles and blood flow. This causes the release of lubricating fluid which subsides any stiffness in your body. In these 5 minutes of walking, you burn 5 calories per minute, as against 1 calorie per minute that is burnt when your body is at rest. In this period, as your heartbeat increases, you begin to burn about 6 calories per minute. The release of chemicals causes more pumping of the oxygen and blood in the body. At this point, a slight rise in the level of blood pressure can be encountered as the chemicals are released and the blood vessels are expanded, as a result. In this period, you begin to walk faster and breathe harder and burn about 7 calories per minute. You begin to perspire as the body temperature keeps rising. Specific hormonal release fuels the muscles in the body. At this point, your body feels free from tension and you begin to feel positive and good. As your walk becomes brisker, you burn more body fat and the insulin level falls. Together, this helps battle diabetes or excess weight. With continuous walking for 45-60 minutes, your body may feel tired as the stored carbohydrates are reduced. As your pace gradually decreases, your heart rate decreases too, thus cooling down your body. The number of calories burnt per minute reduces but is still more than what you would have burnt at rest. 60 minutes of walking elevates your calorie burn further for up to 1 hour. The entire cycle runs without a single conscious thought in our mind. Such amazing is the human body!